Daniel G. Giaquinto, Esq. focuses his practice on the defense of healthcare professionals in criminal investigations and prosecutions; State Board licensing matters; and civil penalty, adverse administrative and credentialing matters. He is also qualified in New Jersey as a mediator and provides Alternative Dispute Resolution Services on behalf of the firm. Dan has successfully defended Physicians before criminal healthcare prosecutions, Medical Boards, OPMC & SBME, OPD investigations, as well as Medicare Fraud, Fraud & Abuse, Hospital Actions, RAC Audits, Medicare Audits, OIG Fraud, Health Care Fraud, Medical Audits, and Health Plan Billing Audits. 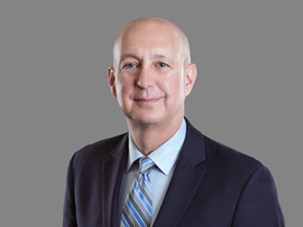 Prior to joining Frier Levitt, Dan spent 11 years working as a healthcare attorney, following a career in the public service sector in New Jersey. From 1998 until 2003 he served an appointed term as the Prosecutor of Mercer County, New Jersey, where he led an office of over 150 assistant prosecutors, detectives, and administrative support personnel. As the Chief Law Enforcement Officer in Mercer County, he was responsible for the detection, apprehension and prosecution of violators of state law, as well as the coordination of law enforcement efforts, within the county. In 2003 he was selected by the New Jersey Attorney General to serve as the Assistant Attorney General/ Director of State Police Affairs, where he successfully led the State’s efforts to implement New Jersey State Police reforms required by the federal consent decree to address issues of racial profiling. In that role, he served as the State liaison to the Department of Justice Civil Rights Division, the Independent Monitoring Team, the United States District Court and the New Jersey State Police. His office was also responsible for the administrative prosecution of State Police disciplinary hearings. Dan has also served eight years as a Municipal Court Judge for the City of Trenton and six years as the Municipal Court Judge for the Township of Hopewell. During his years as a municipal court judge he ran a part-time solo private practice in Hamilton, New Jersey. Earlier in his career he served for three years as a Deputy Attorney General in the Major Fraud Section of the Division of Criminal Justice, New Jersey Attorney General’s Office, where he was responsible for investigating and prosecuting white collar and fraud related crime. He has also worked for a general practice law firm in Hamilton, New Jersey, for two years early in his career where he focused his practice on personal injury defense work and municipal court and criminal defense. A member of the U.S. Army Judge Advocate General’s Corps (JAG), Dan began his legal career as a U.S. Army Captain, serving a four-year active duty tour in Germany, where he was assigned first as defense counsel, and later as a trial counsel (prosecutor), to military courts-martial (criminal prosecutions) and administrative hearings (separation and reduction boards). Subsequent to active duty, he continued his military career with the New Jersey Army National Guard, from which he retired as a Colonel in 2011 with thirty years of military service. During his time in the New Jersey National Guard, he attained the leading legal position of Staff Judge Advocate, which he held for nine years, and in his final year served as the head of the Intelligence Directorate. He deployed from June 2008 until June 2009 as the Command Judge Advocate, 50th Infantry Brigade Combat Team, Operation Iraqi Freedom, in Baghdad, Iraq. Dan is also a graduate of the U.S. Army Judge Advocate Officer Basic Course, and an honor graduate of the US Army Judge Advocate Officer Advanced Course, the US Army Military Judges Course, and the US Army Command and General Staff College.